‘The English Republican Exiles in Europe’ (in preparation). 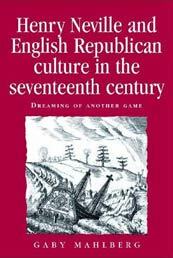 Henry Neville and English Republican Culture in the Seventeenth Century: Dreaming of Another Game (Manchester: Manchester University Press, 2009). John Callow, History, 95 (2010), pp. 380-2. Johann Sommerville, Journal of British Studies, 50 (2011), pp. 484-5. Bernard Capp, English Historical Review, 521 (2011), pp. 942-3. Cesare Cuttica/Gaby Mahlberg (eds), Patriarchal Moments (Bloomsbury Academic, 2016). Carol Gold, Journal of World History, 28:1 (2017), pp. 150-153. Dirk Wiemann/Gaby Mahlberg (eds), Perspectives on English Revolutionary Republicanism (Farnham: Ashgate, 2014). Feisal G. Mohamed, Renaissance Quarterly, 68:3 (2015), pp. 1085-1087. Bernard Capp, English Historical Review, 131: 549 (2016), pp. 452-4. Gaby Mahlberg/ Dirk Wiemann (eds) European Contexts for English Republicanism (Farnham: Ashgate, 2013). Vittoria Feola, Sixteenth Century Journal, XLV/4 (2014), pp. 1024-25. Victoria Anker, The Seventeenth Century (2014). Jutta Schwarzkopf, Journal for the Study of British Cultures, vol. 20, no. 2 (2013), pp. 191-5. Nina Schweisthal, in: H-Soz-u-Kult, 13.05.2014, <http://hsozkult.geschichte.hu-berlin.de/rezensionen/2014-2-106>. Matthew Johnson, in: History of European Ideas (2014). Sebastian Meurer, in: Francia-Recensio (2014). ‘Machiavelli, Neville and the seventeenth-century discourse on priestcraft’, Intellectual History Review, 28:1 (2018), pp. 79-99. ‘Les Juges Jugez, se Justifians (1663) and Edmund Ludlow’s protestant network in seventeenth-century Switzerland’, Historical Journal, 57 (2014), pp. 369-396. ‘Authors Losing Control: The European Transformations of Henry Neville’s The Isle of Pines (1668),’ Book History, 15 (2012), pp. 1-15. ‘The republican discourse on religious liberty during the Exclusion Crisis’, History of European Ideas, 38 (2012). ‘Henry Neville and the Toleration of Catholics during the Exclusion Crisis’, Historical Research, 83:222 (2010), pp. 617-34. ‘Neo-Harringtonianism and A Letter Sent to General Monk (1660) revisited’, The Seventeenth Century, 24:2 (2009), pp. 305-322. With Peter Stillman and Nat Hardy, ‘The Isle of Pines Special Issue,’ Utopian Studies, 17.1 (2006). ‘Wansleben reads Harrington: Wansleben, the Harrington Manuscript, and English Republicanism’, in: Asaph Ben-Tov, Jan Loop and Martin Mulsow (eds), Ludolf und Wansleben – Orientalistik, Politik und Geschichte zwischen Gotha und Afrika 1650-1700 (Brill: Leiden: 2019 forthcoming). ‘Charles Stuart as office-holder: On regicides and monarchical republicans’, in: Anette Pankratz/ Claus-Ulrich Viol (eds), (Un)Making the Monarchy (Heidelberg : Winter, 2017). ‘Le républicanisme anglais et le mythe de l’anticatholicisme’, in: Guillaume Marche/ Nathalie Caron (eds), La politisation du religieux en modernité (Rennes: Presses universitaires de Rennes, 2015), pp. 1-14. ‘Contexto histórico y político de The Isle of Pines. El marco biográfico’, in: Lucas Margarit y Elina Montes (eds), Textos utópicos en la Inglaterra del siglo XVII, 2 vols (Buenos Aires : Saberes, 2014), vol. i, pp. 55-68. ‘Wansleben’s Harrington, or “The Fundations & Modell of a Perfect Commonwealth”’, in: Gaby Mahlberg/ Dirk Wiemann (eds), European Contexts for English Republicanism (Farnham: Ashgate, 2013). ‘An island with potential: Henry Neville’s The Isle of Pines (1668)’, in: J.C. Davis/ Miguel A. Ramiro, Utopian Moments: Micro-Historical Approaches to Modern Literary Utopias (London: Bloomsbury Academic, 2012), pp. 60-66. ‘Patriarchalism and the monarchical republicans’, in: C. Cuttica and G. Burgess (eds), Monarchism and Absolutism in Early Modern Europe (London: Pickering & Chatto, 2012). ‘Author-Politicians and Political Authors: The Example of Henry Neville (1619-94),’ in: Joachim Frenk/ Lena Steveker, Anglistentag 2010, Saarbrücken, Proceedings [= Proceedings of the Conference of the German Association of University Teachers of English, xxxii] (Trier: Wissenschaftlicher Verlag, 2011), pp. 247-254. ‘”All the conscientious and honest papists”: Exile and Belief Formation of an English Republican: Henry Neville (1619-94),’ in: Barbara Schaff (ed. ), Exiles, Emigrés and Intermediaries: Anglo–Italian Cultural Transactions (Rodopi: Amsterdam/ New York, 2010). ‘Republicanism as anti-patriarchalism in Henry Neville’s The Isle of Pines (1668),’ in: J. Scott/ J. Morrow (eds. ), Liberty, Authority, Formality (Imprint Academic, 2008). ‘Matthew Hale on the Law of Nature, Reason, and Common Law: Selected Jurisprudential Writings, ed. Gerald J. Postema. Oxford: Oxford University Press, 2017, ISBN 9780199234929, £50.’ Archives (forthcoming). ‘Writing Conscience and the Nation in Revolutionary England, by Giuseppina Iacono Lobo (Toronto: University of Toronto Press, 2017; pp. 256. $56.25).’, English Historical Review, 134: 566 (2019), pp. 00-00. ‘Marco Barducci, Hugo Grotius and the Century of Revolution 1613-1718: Transnational Reception in English Political Thought. Oxford: Oxford University Press, 2017. 224pp.’ Grotiana, 39 (2018), pp. 137-151. ‘Women Writing the English Republic, 1625-1681. Katharine Gillespie. Cambridge, Cambridge University Press, 2017, ISBN: 9781107149120; 362pp. ; Price: £74.99’, Reviews in History, Review 2197 (November, 2017). ‘Quentin Skinner and Martin van Gelderen (eds), Freedom and the Construction of Europe, 2 vols (Cambridge: Cambridge University Press, 2013), 411 + 405 pages, £100 (2 vol set), ISBN 978-1-107-03184-5, hbk.’, European History Quarterly, 45:3 (2015), pp. 596-600. ‘God’s Instruments: Political Conduct in the England of Oliver Cromwell, Blair Worden, 2012, Oxford: Oxford University Press, xi + 421 pp., ISBN 978-0-19-957049-2’, Bunyan Studies, 18 (2014), pp. 148-52. ‘The Isle of Pines, 1668: Henry Neville’s Uncertain Utopia, John Scheckter, 2011, Farnham: Ashgate, xvii + 222 pp., ISBN 9781409435846 (hbk)/ 9781409435853’, Restoration: Studies in English Literary Culture, 1660-1700, 37:1 (2013), pp. 87-9. ‘Gender and the English Revolution, Ann Hughes, 2012, London and New York: Routledge, viii + 181pp., £21.99. ISBN 978-0-415-21491-9’, Women’s History Review, 22:3 (2013), pp. 516-8. ‘Political Biblicism and the Coming of Civil War,’ History of European Ideas, 38 (2012), pp. 307-11. M. Nevitt, Women and the Pamphlet Culture of Revolutionary England, 1640-1660, Aldershot, Ashgate, 2006, pp. 218. hb. £45, ISBN: 0754641155, The Seventeenth Century, 22 (2007), pp. 190-2. ‘German historians and the English Revolution,’ in: M. Caricchio, G. Tarantino, eds. Cromohs Virtual Seminars. Recent historiographical trends of the British Studies (17th-18th Centuries), 2006-2007: 1-4. Two entries for the Oxford Dictionary of National Biography on Lady Anne Townshend (1573-1622), and Lady Katherine Paston (1578-1629), c 650 words each. (2005). ‘A Parliament of Ladies und die Öffentlichkeit des Privaten: politischer Diskurs im England des 17. Jahrhunderts,’ in: Offen und Verborgen: Vorstellungen und Praktiken des Öffentlichen und Privaten in Mittelalter und Früher Neuzeit, eds. Caroline Emmelius et al. (Göttingen, 2004), pp. 229-47. ‘The Politics of Patriarchalism in C17th-Century Pamphlet Literature,’ Women’s History Magazine, 46 (2004), pp. 4-9. ‘Jude, Christ, Gelehrter: Camilleri «Jagd nach einem Schatten»’, Rhein-Neckar-Zeitung, 22/08/2018. with Christina Horsten, ‘US-Fußballstar Hope Solo: Blatter hat mich begrapscht’, Südwest Presse, 11/11/2017. ‘Von Heiden und Katholiken’, Ruhr Nachrichten, 29/08/2017. with Silvia Kusidlo, ‘Theresa May – eine Frau steht sich selbst im Weg’, Neue Presse, 21/06/2017. with Jacqueline Rother, ‘Die Queen ist der Fels in der Brandung’, Mittelbayerische, 18/06/2017. with Silvia Kusidlo, ‘Opfer und Helden in London’, Grenzecho, 05/06/2017. ‘Der Terror kehrt zurück nach London’, Frankfurter Neue Presse, 04/06/2017. with Silvia Kusidlo, ‘Manchester: «Ein riesiger Blitz, ein Knall und Rauch»’, Walsroder Zeitung, 23/05/2017. ‘Eco sieht in die Zukunft und beschwört das Alte’, Volksstimme, 14/2/2107. with Deepak Adhikari, ‘Kindgöttin außer Dienst’, Schweriner Volkszeitung, 03/02/2017. with Rosmery Cueva Sáenz, ‘Jenseits der Gipfelwelt: Die «Verschwundenen» von Peru’, Amerikawoche, 17/11/2016. ‘Zwei Weltkriege, eine Weltmeisterschaft und ein möglicher Brexit’, eu-info.de, 21/06/2016. with Peer Meinert, ‘Politicians around the world congratulate London’s first Muslim mayor’, dpa International, 07/05/2016. ‘Utopia wird 500: Vom humanistischen Text zum Kultbuch der Sozialisten’, MuensterlandZeitung, 25/01/2016. ‘De África a América: millones de personas huyen de la guerra y la pobreza’, El Mundo, 17/06/2015. ‘Debatte über islamistischen Einfluss an britischen Privatschulen’, KNA, 24/11/2014. ‘Ein Lernparadies mit hohem Preis’, duz Magazin, 03/14, 21 February 2014. ‘Reise des Papstes ist “fast ein bisschen britisch”, KNA, 19/09/2010. ‘Dunkle Wolken über der Insel’, KNA, 25/05/2009. ‘The search for sense’, eurotopics, 11/2008. ‘The Colosseum is full of holes’, dpa, 09/08/2007. ‘A new EU constitution – matter of the right packaging?’, dpa, 12/05/2007. ‘”Wir nehmen auch Euro”‘, dpa, 20/06/2004. ‘Deutsche Wissenschaftler wandern ab’, dpa, 17/06/2004.